I thought bowling had gone the way of seat belt-less kids crammed into the back of station wagons, “Kojak” and Brut aftershave. The blue-collar pastime seemed earmarked for a time capsule stuffed to the brim with various other artifacts and mementos from the '60s and '70s – things perhaps our parents or grandparents were into, and heavily so, but are no longer applicable to life in the 21st century. But in Buffalo, bowling never got the “cease and desist” memo. Though its present-day status doesn’t rival its late-50s-to-mid-70s heyday, when all three major local networks aired regional bowling shows and the best bowlers in town received nigh-on-rock star treatment, bowling in Buffalo remains a healthy, if slightly diminished, business. Unlike so many other cultural blasts from the not-so-distant past, this one seems to be resonating across age and economic/demographic borders. They might have replaced their frothy pitchers of Genesee, Utica Club or Schaefer with cold bottles of hipster-approved Community Beer Works IPA, and you won’t see a middle-aged steel worker launching his ball down the lane with an ash-dangling cigarette clenched between his lips these days, but around here, people still love to bowl, even if the blue-collar jobs they packed the alleys to forget about for a while are, largely, long gone. Strikers Bowling in West Seneca is jamming, its parking lot crammed, cars now spilling over into empty lots of adjacent businesses. In the front room on this Saturday night, where a large bar and dining area reside, people are partying hard, aided and abetted by the efforts of local cover band the Strangers, as they make their way through a pair of Paul McCartney corkers (“Maybe I’m Amazed,” “Jet”) and into feral take on a mid-90s Alanis Morissette hit (“You Oughta Know”). Massive screens spread throughout the space silently broadcast sporting events. You’d think you were in any random suburban sports bar on St. Patrick’s Eve, were it not for the fact that, through a broad doorway to the left of the bar, 24 lanes echo with the sounds that, for many of us, offer a direct portal back to a time when our grandparents blew off the steam generated through five weekdays spent working in the factory by chain-smoking, drinking beer and attempting to decimate a row of bowling pins with a 15-pound polyurethane sphere. The lanes are bustling on this blustery Saturday night, with a crowd that offers a mix between folks who look like they’ve been doing this on a serious basis for decades, families out for an innocent night of fun, and 20- and 30-something couples who appear to be on dates. The scene does not suggest a pastime in its dying days, but rather, a healthy and festive vibe. 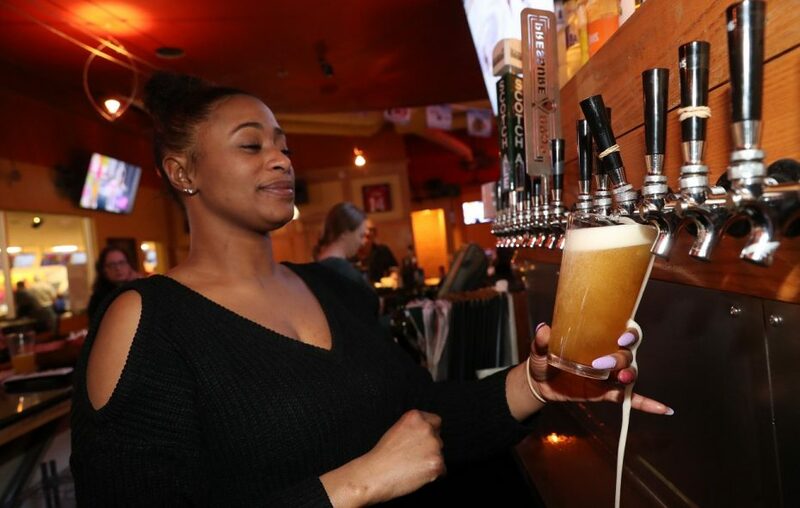 You might think you’ve entered a wrinkle in time, that you’re witnessing something virtually unchanged from its 1975 guise, but for the fact there’s an impressive beer menu boasting a broad range of craft lagers, ales, IPAs and witbiers. Then a large menu board flanking the bar seals the deal. “We now feature a large selection of gluten-free beers!” it proclaims. Yes. This is most definitely 2019. 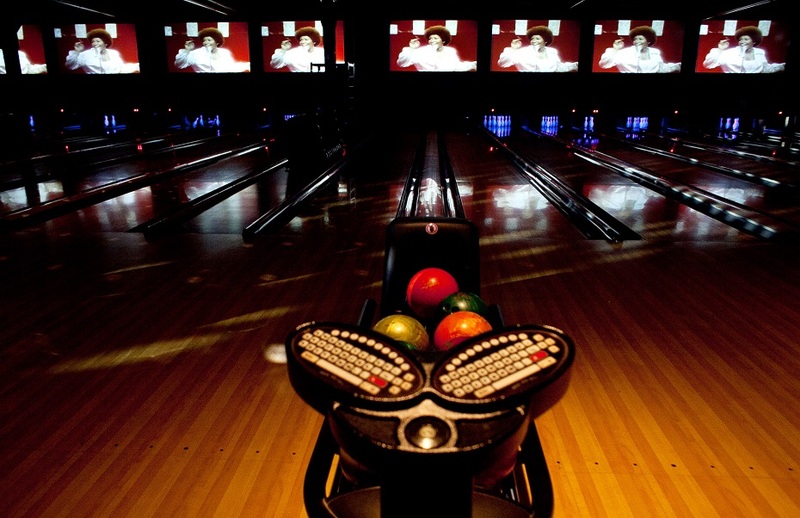 Perhaps bowling’s status as a hipster-approved activity has its roots in the 2009 opening of Brooklyn Bowl, the 16-lane, green-constructed, locally brewed-beers-only bowling emporium and concert venue in the Williamsburg neighborhood of New York City’s most populous borough. The gamble on potential cross-over between music-lovers and bowling fans has paid off for the club, with satellite versions opening in Las Vegas and London in recent years. When the 60-lane Thruway Lanes facility in Cheektowaga closed its doors in 2015, many sounded the death knell for Buffalo bowling. That proved to be premature. There are more than 20 bowling facilities in the region at present, among them the oldest facility in town, Voelker’s Bowling Center (686 Amherst St.), which was established in 1892. AMF franchise facilities in town include Airport Lanes (3754 Genesee St.) and Lancaster Lanes (4913 Transit Road). Kenmore Lanes (1691 Kenmore Ave.) is open seven days a week, hosts several bowling leagues, and courts the younger demographic with its late-night “Moonlight Bowling” specials on Friday and Saturday evenings. Perhaps taking a page from the Brooklyn Bowl playbook – while acknowledging this is Buffalo, not Brooklyn, and that new ideas tend to take longer to catch on here – would bring the local bowling scene firmly into the future. It seems some establishments are already on board with that idea. The Tonawanda Bowling Center is not shy about its desire to push the pastime firmly into the 21st century. Its website might risk alienating some old-school bowlers, but the facility seems to have gotten the memo regarding our region’s infatuation with good food and even better beer. 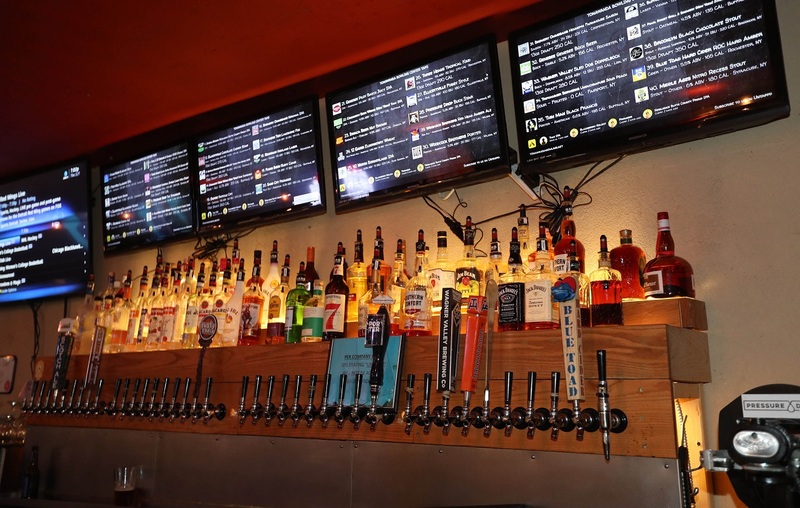 “We are not your father’s bowling alley,” reads the bold print at TonawandaBowling.net, which touts 48 taps featuring 30 local brews and a custom smoker for barbecue. 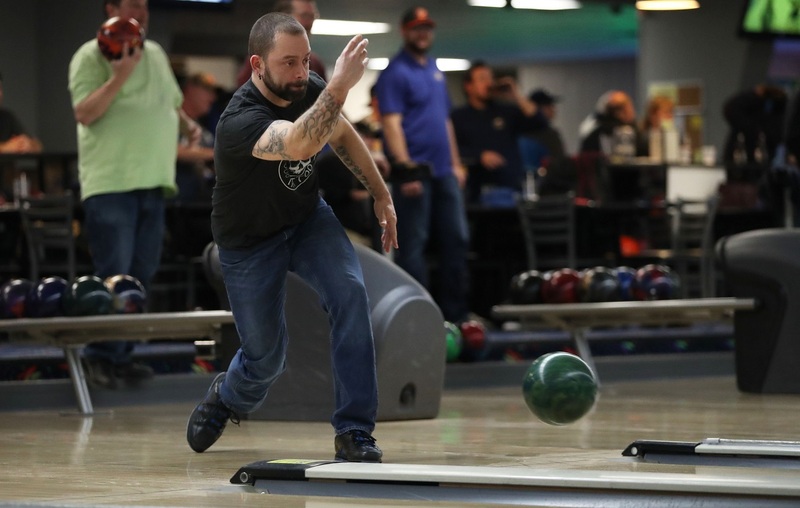 Interestingly, the ideal demographic for a devout modern-day bowler might actually be someone who has a reverence for the pastime’s history, and is also comfortable with its evolution. I asked a musician friend who also happens to be a millennial and a long-time bowler what a trip to the lanes symbolizes for him. “I’ll preface this by saying I don’t bowl anymore, and not by choice,” drummer and multi-instrumentalist Ryan Nogle of Tonawanda said. “I snapped something in my wrist back in 2015 when I was on the road with Aqueous. Haven’t been able to bowl since. It’s a complete bummer. “I grew up bowling, mostly at Tonawanda Bowling Center. Both of my parents were in a bowling league from the time I was born, and I would frequently attend and watch. Occasionally, if someone was absent, I’d be allowed to bowl as a ‘pacer.’ That was always a delight. I loved it. Both of my older brothers were avid bowlers, as well. I bowled in Saturday morning kids' leagues for years. I also bowled on my high school’s team.